New Virginia Gov. 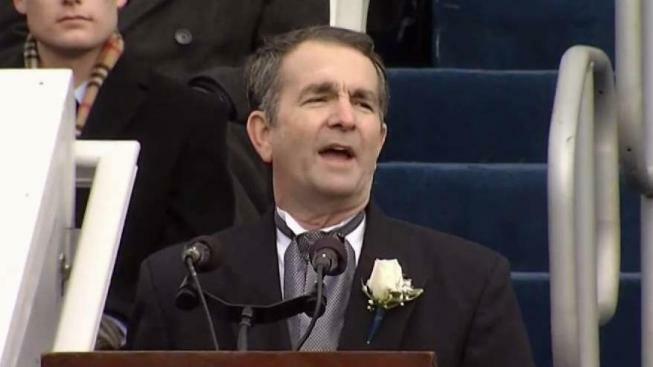 Ralph Northam spoke of hope and outlined the plans for his administration as he took the oath of office on Saturday and became the state’s 73rd governor. The Democrat won November's election thanks to strong voter antipathy toward President Donald Trump. The ceremony on Saturday included the swearing in of Lt. Gov. Justin Fairfax and Attorney General Mark Herring. In prepared remarks, Northam said one of his goals was to accept ideas from both sides of the political aisle in an attempt to improve the life of the residents of Virginia. The new governor honored the service of military and spoke about Virginia’s history, both good and bad. Northam talked about his experiences as a youth on the water and his dad’s advice about always having a compass in life. Later, while referring to his time as a cadet at the Virginia Military Institute and as a doctor, the governor said the state needs a moral compass for the days ahead. “My dad’s advice stayed with me when I reached the Virginia Military Institute and was given a different kind of compass in the simple words of the VMI honor code: ‘A Cadet will not lie, cheat, steal, nor tolerate those who do.,’” Northam said. He promised to always tell the truth and maintain the trust from Election Day by putting Virginia’s interest first.